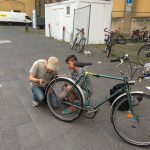 Bicycle Workshop Hangar 1/ Tempelhof Airport – THFwelcome e.V. 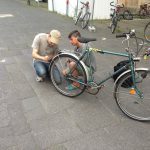 Together with refugees, we repair bicycles and make them roadworthy! 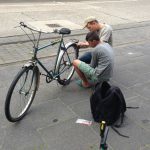 Bicycles can help them to overcome the isolation of their lifes as refugees and give easier access to the city life in Berlin – whether for the way to work, to school, to meet friends and relatives or simply for a bicycle tour. 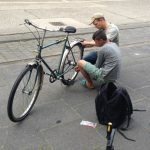 With metal sponges and creep oil, we clean out rusty parts and make them standard, patch hoses or mount new brakes. 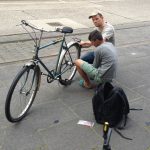 We are more than happy about every single proper donation like tools, bicycle parts, repair kits and the like! You are welcome to visit and join us!